HO3S Dragonfly of the US Coast Guard. 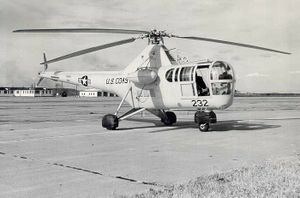 The H-5 was designed to provide a helicopter having greater useful load, endurance, speed, and service ceiling than the Sikorsky R-4. The first XR-5 of four ordered made its initial flight on August 18, 1943. In March 1944, the United States Army Air Forces ordered 26 YR-5As for service testing, and in February 1945, the first YR-5A was delivered. During its service life, the H-5 was used for rescue and mercy missions throughout the world. It gained its greatest fame, however, during the Korean War when it was called upon repeatedly to rescue United Nations' pilots shot down behind enemy lines and to evacuate wounded personnel from frontline areas before being replaced in most roles by the H-19 Chickasaw. It was also manufactured under license in Britain by Westland as the Dragonfly I, all of which were powered by a 500hp Alvis Leonides engine. More than 300 H-5s had been built by the time production was halted in 1951. 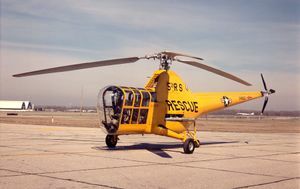 The R-5 was designated under the United States Army Air Force system, a series starting with R-1 and proceeded up to about R-16. In 1947 with the start of the United States Air Force, there was a new system, and many aircraft, but not all, were redesignated. The R-6 became the H-6. The United States Army broke off with its own designation system in the 1950s, resulting in new designations for its helicopter projects (such as HO-6). In 1962 under the new tri-service system (see 1962 United States Tri-Service aircraft designation system), many Navy and Army aircraft were given the low numbers. Under the 1962 system, the low H numbers were given to new aircraft. For example, H-6 was given to the HO-6, which entered service then as the OH-6. This page was last edited on 7 March 2007, at 23:32.